It's always fun seeing where the mind wanders, and last night it wandered into beer bottle carriers. It started as a quick mental though to see how much those bottle carriers cost. Since I started home brewing beer about this time last year, and give out some to friends those bottle carriers are a decent thing to have. Six pack carriers are simple to get - go to store that sells glass bottles of beverages and chances are it comes in a cardboard carrier. However, as a home brewer we may not want another breweries logo wrapped around a distributable brew of your own. A bit of spray paint can solve that problem, or if you develop finer tastes a store that lets you mix and match a 6 pack may offer carriers that yes, has a logo, but not one of a brewer's. If you're allergic to brand names of all varieties � la Cayce Pollard (from William Gibson's Pattern Recognition) blank six pack carriers can be had for less than a dollar. Now while I have uses for 6 pack carriers, if I'm giving friends home brew I'm not so sure about giving them a full six pack. Putting fewer in a carrier works but it feels a little cheap to be a gift. The solution my mind targeted on was 4 pack carriers. While big name brewers seem to prefer multiples of 6, a microbrewery (and the ones that didn't forget that they were) may make something different enough that 4 packs make sense. The blanks versions also exist, but I wasn't finding luck in anything other than bulk. Per piece they're dirt cheap, but I don't brew enough to want a couple hundred carriers for nearly a thousand bottles. So the next mind journey was a template for making one. Which is where the cool things started showing up. I didn't find digital templates to download and print, but got reminded that a reverse engineering approach would work in a pinch. Mostly suggested for those common 6 packs, but true too for a four pack. The next little discovery was at one point in history a glorified cardboard box once was patented. Or rather multiple times. While I was googling around for a 4 pack template, Free Patents Online popped up with a patent for a collapsable four pack carrier that aims for minimal gluing and materials with a PDF of all it's diagrams and details. 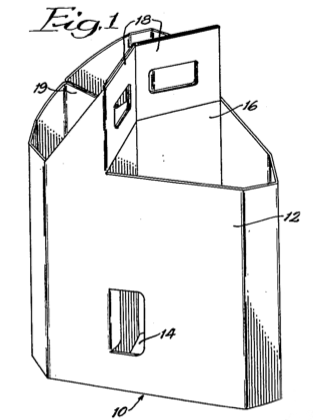 It also lists it's past resources, including other collapsable 4 packs, to older 6 pack designs, to a patent for a Three-bottle collapsible carrier - which as a geek I love. It appears unpurchasable, but it maybe worth making one for myself.